OPINION: Is the computer mouse obsolete? It’s quite possible. The future seems to belong to gestural computing. Whether it’s the latest Mac or PC, iPad or Android tablet, the best way to interact with it is with swipes of a trackpad. The mouse as we know it might just be an afterthought. Mice fit in the palm of your hand and so they can’t be very big. On the other hand, controlling using touch and gestures can use a 2×3 trackpad or a 20″ screen. In the case of XBOX 360 Kinect, gestural computing can take up the entire living room as you flail about in control of online characters. In the past, trackpads were thought of as difficult and imprecise. They’ve improved a lot thanks to smartphone technology (trackpads are just really touchscreens without the screen.) Today’s trackpads are smooth, clean and precise while giving just enough feedback. A generation who grew up bringing laptops to class is super-comfortable with them. Add to that, the trackpad and touchscreen require a broader range of motion. This can be tiring at first compared to the tiny flicks you are used to with a mouse, but it’s better for you. Repetitive motion injuries caused by mice are a part of our everyday lives — before 1990 no one had heard of carpal tunnel syndrome except athletes, and today it’s the scourge of daily computer users. 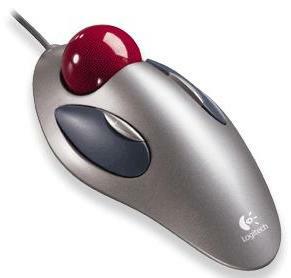 What of the trackball, that 1980s-video-game-inspired ball that sits on the desktop like an upside-down mouse daring you to control it? Some love it, but it’s never gotten the level of acceptance that mice and trackpads have, due to a high learning curve. Perhaps its heyday was in the late 1990s when they were popular clip-on accessories to laptops without trackpads. By the way, mice, trackpads and trackballs weren’t the only ideas out there. Who remembers the little red nubbin on IBM laptops in the early 2000s? It was a little tiny joystick that never really worked. Lately, we’ve seen a lot more emphasis on touch, and we’ve seen some truly innovative things like the Surface Dial which could create a whole new category of input devices. I personally think that it will be limited to creative types at first but it’s hard to know… it could really catch on. How long should a hard drive last?